Nspa Lime Shower Gel // This was the month that all my shower gels ran out at the same time! I like to have a couple of different shower gels on rotation so I don't get sick of the same scent. This was my go to morning shower gel as the lime scent really helps to wake you up. It's also only about £2 for 500ml and it lasts forever and makes a really good bubble bath. Repurchase? I'm currently using the passion fruit version but I will buy this scent again at some point. 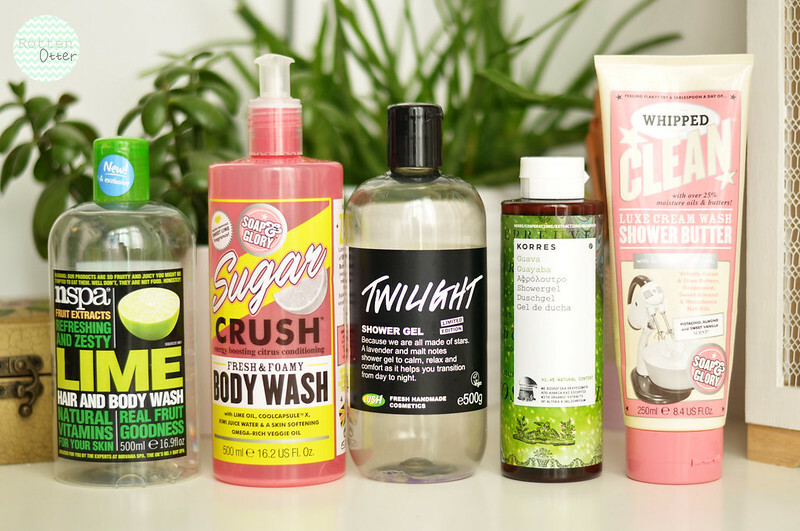 Soap & Glory Sugar Crush Body Wash // This is another lime scented shower gel but with a mix of sweetness that reminds me of lime and coke. This shower gel is also really moisturising and the pump bottle means it lasts a really long time. Repurchase? Yes and I need to buy another tub of the body scrub! Lush Twilight Shower Gel // This is one of Lush's limited edition products and has the same scent as the Twilight bath bomb. The scent is a mix of lavender and malt, a very relaxing scent and perfect for a bubble bath before bed. Repurchase? If it was still available, yes, but I still have another bottle to use. Korres Guava Shower Gel // This shower gel instantly reminds me of holidays and summer, it has the most amazing scent.I also love the formula as it lathers well but feels very moisturising on the skin. Repurchase? yes at some point. Soap & Glory Whipped Clean Shower Butter // I was a bit disappointed by this product and that doesn't often happen with Soap & Glory products! I really liked the sweet scent but I didn't find it very moisturising and still had to use a body cream afterwards which defeats the whole point of it really. Repurchase? No, the Nivea version is a lot better. Barefoot SOS Dry Scalp Treatment Shampoo // I think this is my second bottle I've finished and although I loved it in the beginning, I think my scalp might have reacted to it and it irritated my eczema. It could have just been a coincidence and my scalp reacted to something else but I don't think I'm going to buy it again and risk it happening again. Philip Kingsley Flaky/Itchy Scalp Shampoo // This is one of my favourite shampoos I've ever tried as it's completely changed how my scalp is and has reduced my eczema. I also love the apple scent and it reminds me of shampoos I used when I was little. Repurchase? I already have! The Body Shop Banana Conditioner // I only bought this because I used to use it when I was little and the scent completely brings back my childhood. The conditioner itself is just average though and although I enjoyed using it, it was mainly for the scent. Repurchase? No. The Body Shop Grapefruit Body Butter // I tend to use The Body Shop Body Butters as foot creams as they've incredibly moisturising and work even better than most foot creams I've tried. I love the grapefruit scent as well. Repurchase? Not at the moment as I have a couple of other scents to use first. Rituals Ginko Hand Cream // Technically I haven't finished this hand cream but the packaging kind of exploded and I had to decant it into another tub. 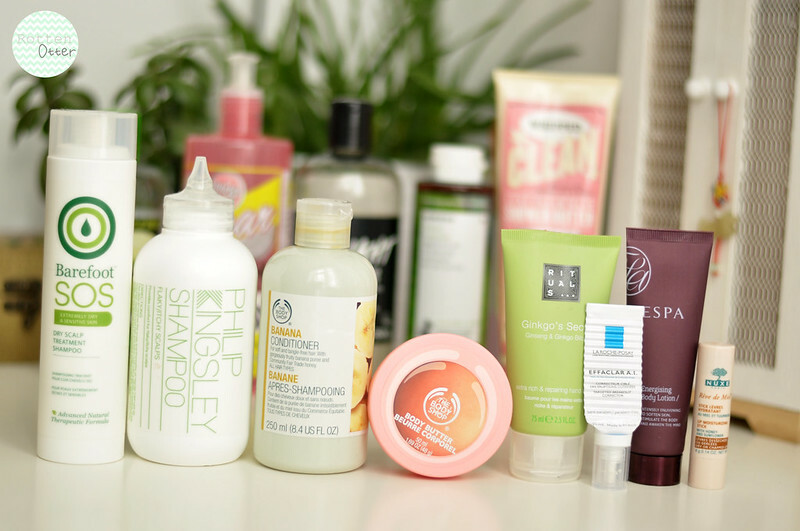 I thought I'd just include the tube in this empties post anyway so I don't have to keep hold of an empty tube until I've properly finished it. I really enjoyed using this hand cream and properly trying out the brand Rituals. It has a lovely fruity scent and sinks in really quickly but is still very moisturising. Repurchase? I have a million and one other hand creams to finish first but I would buy this one again. La Roche-Posay Effaclar A.I // Despite this getting a lot of rave reviews from other bloggers, it just didn't seem to work for me. First of all I hate the metal packaging and probably wasted three quarters of the product as too much product comes out if you squeeze the tube. It also didn't do anything to reduce spots. Repurchase? No. Espa Energising Body Lotion // This was an ok body lotion but it wasn't anything impressive. The scent was nice but again just pretty average and not worth the £25 price tag. Repurchase? No. Nuxe Reve De Miel Lip Moisturising Stick // Although the stick version of this lip balm isn't as good as the pot, it's so convenient as I don't have to use my fingers to apply it. I'm able to keep it in my bag and use it at work without worrying about it being unhygienic. Repurchase? I'm currently using a Fresh Lip Balm but I would buy this one again as it's pretty cheap.